The press invites for Mobile World Congress (MWC) are starting to roll out in waves. 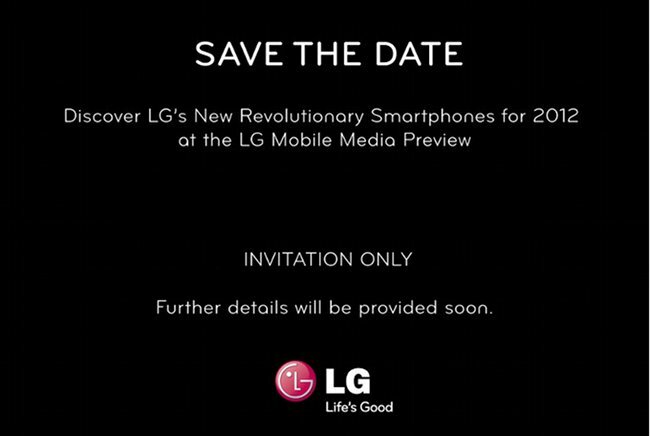 The latest is from LG, who plans to show off “Revolutionary Smartphones” at the event, 3 of which we may already know about. While LG doesn’t have the greatest of reputations when it comes to Android phones, they are certainly making a big play in 2012. Here are some of the LG leaks that have a better than average chance at making an MWC appearance. LG X3: Rumored to be LG’s first NVIDIA Tegra 3 quad-core device, it sports a 4.7″ HD screen, runs Ice Cream Sandwich, and has an 8MP camera. Not many other details are available, but with that screen size and the fact that it has a Tegra 3, we are willing to give it the benefit of the doubt. More info. Optimus 3D 2: For whatever reason, LG has decided to create another 3D smartphone even after the sub-par performance of the LG Thrill. This 2nd edition will feature a NOVA display, dual-core processor, and a thinner body. Not much else is expected from it. If you like 3D on phones, this should be right up your alley. More info. Optimus Vu: The wildcard and potentially most interesting of the 3 phones is the Optimus Vu. Rumored to sport a 5″ screen with a 4:3 aspect ratio, NFC, 1.5GHz dual-core processor, dual cameras and Gingerbread, you have to at least want to fondle this thing once, don’t you? Its square-like body brings such an odd shape to the smartphone realm that LG at least has our attention on this one. More info. Three offerings that LG expects to revolutionize the game. I’m not so sure any of these can do that, but all 3 phones offer something so completely different that we’ll give LG props for at least trying. Interested in any of these devices?